Hemlock makes for excellent railings, risers, nosings, moulding, handrail fittings and balusters for staircases. The grain and soft yellow-white look of Hemlock can be stained to match just about any other wood, painted, or finished to stand out on its own natural beauty. 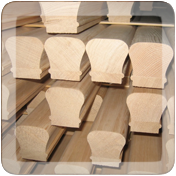 Probyn Export is accustomed to shipping a wide variety of staircase components in mixed container loads. This saves your business time and eliminates potential delays when you order what you need from one single vendor. Contact Probyn Export today!